How much time do you spend running around on Google trying to find the right tool for this and that? Well, look no further. I've compiled the ultimate list of blogging resources for blogging bloggers everywhere. If you need it for your blog, it's most likely on this list. 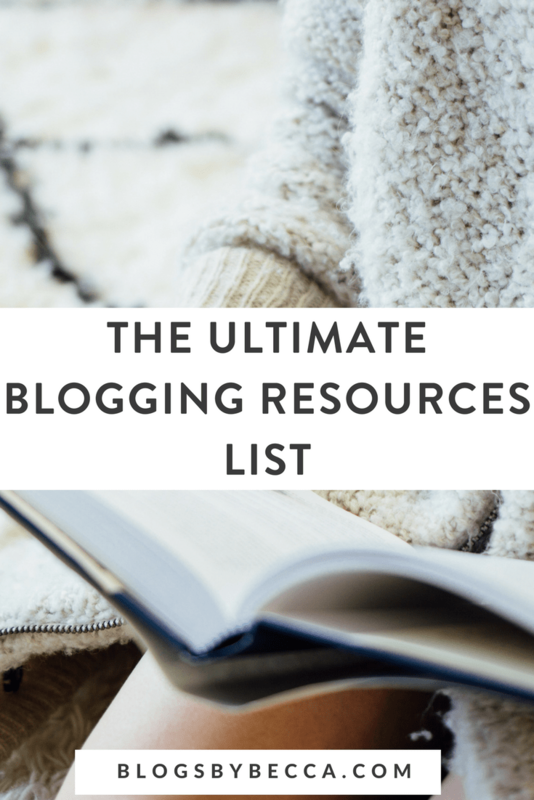 Without further ado, here's the list of ultimate blogging resources. Note: This post contains affiliate links. That means that if you buy something through one of these links, I get a small commission. 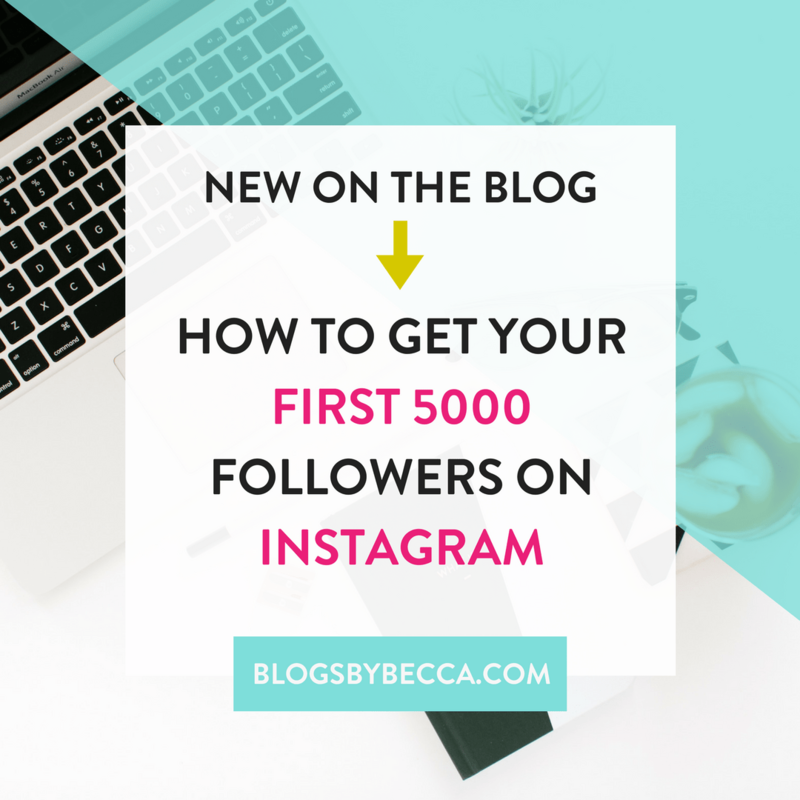 There is zero cost to you, but it helps me fund Blogs by Becca. I appreciate your support! Click here to get The Ultimate Blogging Resource Guide! GET YOUR GUIDE! 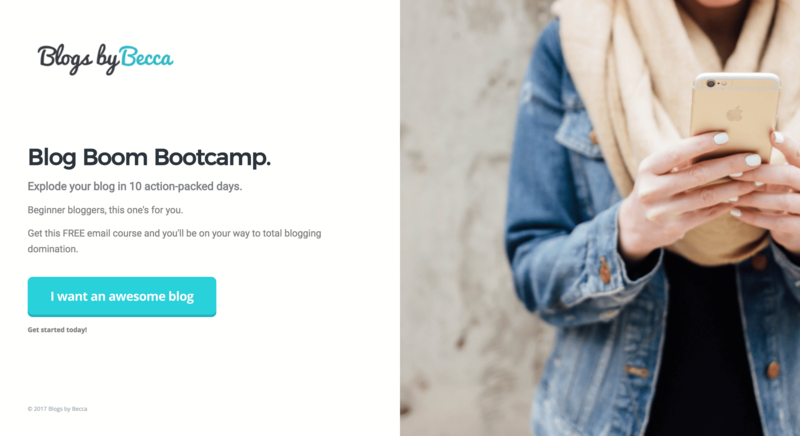 ConvertKit: All email services can send automated emails and keep track of your list. So, obviously ConvertKit does this. But what makes ConvertKit so awesome is its automation features. You can automate everything. Create rules that say “When someone clicks on the link to this Pinterest article, they'll be tagged as ‘Interested: Pinterest' and they'll get a special automated series about my Pinterest course.” Or, “When someone signs up through this form for my Blog Boom Bootcamp course, they'll automatically get 10 days worth of emails from the course.” Everyone on my list is tagged multiple times based on how they signed up and what they're interested in. And they get specific emails based on that. I could go on and on. Love it. Mail Chimp: I'm not a big Mail Chimp fan. But, it is free for up to 2000 subscribers, so that's not a bad thing. And a lot of people swear by it. AWeber: AWeber doesn't seem to have the star power that ConvertKit and Mail Chimp have, but I actually like it. I used to use it for my second blog. It's not as straightforward as ConvertKit, but it does have a lot of the same features. Between the two, though, I'd go with ConvertKit. MailerLite: I've never used MailerLite, so I can't vouch for it either way. But, I include it because I've seen a lot of people that really seem to like it. Also, it's free for up to 1000 subscribers. So, consider it an alternative to Mail Chimp if you're just starting out and/or are on a budget. OptinMonster: OptinMonster has tons of options for opt-ins, including welcome mats, notification bars, pop-ups, inline posts, and more. It's all very customizable. And I like the success messages that come with it, some of which allow for the automatic download of a lead magnet. What I dislike about OptinMonster is that it does not store the email addresses, so I always get nervous that something will happen with the intergration and I'll lose emails. Not that that's ever happened. But, my nerves are my nerves. Leadpages: Second only to ConvertKit, Leadpages is my favorite blogging tool. Use it to create super customizable landing pages OR to create pop-ups that can be used to deliver content upgrades in individual blog posts. I use it literally every day. All of my signups for things like courses and webinars are on Leadpages (see here or here). And I use the Leadboxes/buttons feature to deliver all my content upgrades in individual blog posts. Such as, right here: Click this snazzy little button to get the PDF version of this Ultimate Blogging Resources Guide! GET YOUR GUIDE! (No really, that's not just an example. Do it). For real, I use Leadpages for everything. I do not know how I would blog without it. SumoMe: SumoMe comes with 10 apps. A few of which I honestly don't use. But about half of which are opt-ins, which I totally do use. Welcome mats (my favorite), notification bars, pop-ups, scroll boxes, share bars, and image share buttons. 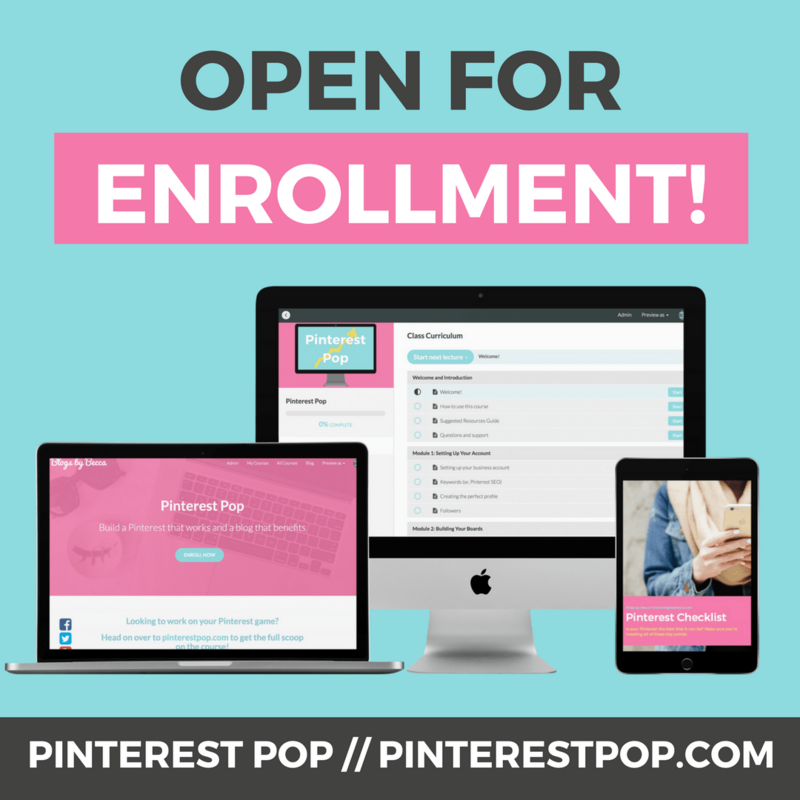 All super useful for opt-ins and social sharing. The free version is totally doable, but if you really want to kick it up a notch, go for the Pro version, which has waaay more design customization features. Their Pro welcome mats are my favorite thing. Convert Plug: I like the look of the Convert Plug opt-ins a lot, and it's very customimzable. Magic Action Box: Lots of customizable “boxes” to be made here. Pop-ups and inline posts, mainly. I find that it has a pretty unique look, which I am a fan of. ConvertKit: CK is an email provider, not an opt-in provider. But, I mention it because I really do like their forms. They're super simple, so if you're looking for some super flashy thing with all the bells and whistles, CK forms are not for you. But I like to mix it up with a mix of the simple and the not simple, so I'm a fan of these. I love ConvertKit anyway for all its email features, so I'd be using it regardless, but I really do like the forms. Bloom: Bloom comes with the Elegant Themes package, which includes 80-something themes (including Divi) and a bunch of plug-ins. It's a good source of your standard opt-in options. Leadpages: See above. I love, love Leadpages. I use the landing pages for all kinds of sign-ups. Courses, email courses, webinars, plain old email opt-ins. Also thank you pages and live webinar pages. It's one of my number one tools, for sure. Highly recommend. Here are a couple examples: here and here. Instapage: Instapage is another landing page provider. I have never used it, but I've heard good things on Twitter (for what that's worth). Bluehost: I used Bluehost when I first started blogging. Inmotion Hosting: I've never used Inmotion, but I've heard good things. Host Gator: I've never used Host Gator, but I've heard good things. Siteground: I use Siteground for this site and love it. They have great customer service. Asana: I use Asana for my task lists and I'm a big fan. It's technically made for team projects, and I'm the sole member of my team, but I find that it works just fine for one person. Make task lists, calendars, projects, etc. It's a great organization tool. I used to say that Trello might be better because of its boards features, but Asana came out with essentially the exact same feature. So, now Asana has them beat (sorry, Trello). And, it's free. Trello: I was a Trello fan until I started using Asana. I really like the boards way of organizing things. And I still like Trello. But, Asana has so many other task lists features. So, if I'm only going to use one (and it doesn't really make sense to use more than one), it's going to be Asana. That being said, I still like Trello, so we can still be friends if you like it better. Evernote: Pretty much the ultimate note-taking app. It does basically everything. I use it to keep track of all my random little notes throughout the day, both for the blog and for all the random “life stuff” that comes up. Google Analytics: You really have to use Google Analytics. As far as I know, there is no second option. It's free, and it's just what everyone uses to track their analytics. So, use it. Iconosquare: Instagram analytics. I love this thing. It tracks every imaginable kind of Instagram analytic. Followers, media posts, what filters you're using, unfollowers…everything. Now, Instagram analytics are probably not a matter of life and death. But, I love them, Iconosquare is not very expensive, and I find that it helps. Sprout Social: Sprout keeps track of Facebook, Twitter, Google Plus, and Linked In. It has very cool analytics. But, it is not cheap (I believe it starts at $60/month). They do a free trial, which is why I've used it. But I won't lie–I do not pay for it. Buffer: Buffer is a social media automation tool, but they also offer social media analytics. HootSuite: Similar to Buffer, it's a social media automation tool that also offers analytics. Google Adsense: Paid Google ads. Pretty much speaks for itself. Outbrain. Paid content ads that go on other websites. Facebook: Obviously we all know what Facebook is. Create a Page for your blog, and maybe a related Group. Twitter: Again, you know what Twitter is. Go tweet. Instagram: And I'm sure you're on board with Instagram. You can read my 7 Tips to Rock It here. Pinterest: You know what Pinterest is, and if you're like me, you're obsessed. Read How to be Perfect on Pinterest right here and start strategizing for your account. 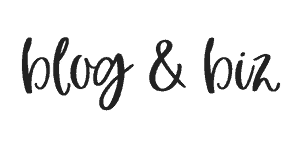 Bloglovin’: If you haven't heard of Bloglovin', it's basically an RSS aggregator for blogs. It's good to have your blog on there because you can get followers and therefore readers. It's free and easy to sign up, so no reason not to. Google Plus: As far as I know, Google Plus is far less popular than Facebook or Twitter. Still, it's got a real presence. I don't use it personally, but plenty of people do. So go for it if you're looking for something new. Flipboard: Flipboard is one that you might not have heard of. It's kind of like Pinterest, except only for articles, and instead of “pinning” you “flip.” You create “magazines” with your favorite articles by “flipping” articles into the magazine. Other people can flip your articles into their magazines and/or follow your magazine. If your social sharing sharebar allows you to add Flipboard, always a good idea to do so. Snapchat (get the app): Snapchat is the hottest thing out there right now. No longer is it just for rambunctious 17 year olds. It now has legitimate business purposes. Reddit: To be honest, I don't really use Reddit. But once in a while one of my posts will get on there, and it will go nuts for a few days. Add a Reddit button if you don't have one. Stumbleupon: Stumbleupon gives people basically random articles based on their interests. Add your articles in there, and someone may stumbleupon them. Once in a while I'll have something get hot on there and I'll get some clicks from it. Quora: Quora is a forum for Q&As. People ask all kinds of questions. If you can answer something with one of your blog posts, do it, and it may get clicked on for ages. Medium: Medium allows people to share all kinds of articles. Most will probably never get noticed, but if you hit it right, you could hit it big. LinkedIn: LinkedIn, is, of course, the professional social network. I don't use it for blog purposes (I do use it for my “real job”), but some people seem to love it. Slideshare: Slideshare (a LinkedIn product) allows you to post slidedecks on all sorts of topics. If one gets popular, you could see a ton of hits from it. I haven't had one go really viral, but anecdotally I've heard that it can happen and can lead to major traffic. Iconosquare: Iconosquare is an Instagram analytics tools. It allows you to see pretty much every kind of analytics you could think of for Instagram–followers, unfollowers, media posted, likes, comments, etc. You can also follow and unfollow people on there (manually, not auto-spam). I use it all the time. Meet Edgar: Meet Edgar is an automated tool for Twitter and Facebook posting. You create a content library with all your tweets/posts, and then Edgar puts them out at scheduled times. The cool and unique thing about Edgar, as opposed to some of its competitors, is that it recycles the tweets/posts. So once it's done them all, it starts back at 1. So you have very little work to do after initial set up. All I do is add any new articles in, which takes all of 10 seconds. The rest is on autocycle, so I spent almost no time worrying about Twitter or Facebook. Thumbs up. Tweetdeck: Twitter scheduling and monitoring. Buffer: Post on Twitter and Facebook, and kind of remind yourself to post on Instagram. Also has analytics. PostPlanner: Schedule posts on Twitter and Facebook. And also find content to post. Sprout: Sprout has amazing analytics on pretty much any Twitter or Facebook subject you could ask about. Expensive, but, great analytics. BoardBooster: BoardBooster is a Pinterest automation tool. You pin your pins at your leisure to “secret boards” and then BoardBooster takes the pins from the secret boards and puts them on your real boards on a set schedule. So that way you're pinning a few things all throughout the day, instead of pinning 100 things at once and then nothing for 3 days. It also has a feature called “looping,” which takes your old pins and re-pins them, giving them another chance to be seen. Also included are analytics, and a cool feature called “Pin Doctor,” which analyzes all your pins and checks for things like broken links that can make Pinterest mad at you. It's a great automation tool. Tailwind: Tailwind is the alternative to BoardBooster (or Board Booster is the alternative to Tailwind, if you prefer). It's also a Pinterest automation tool. You pin things to Tailwind, and then it disperses them on a set schedule. It's got analytics, and lots of ways to view your pins and what's happening with repins, clicks, etc. Another great automation tool. Essential Grid: Create photo galleries or stream your Instagram. Or, create a resource library to share all your content upgrades. Check mine out to see what I mean. I love Essential Grid. One of my favorite plug-ins, for sure. Inline Related Posts: Puts related posts throughout your content. A good way to get more clicks. Slider Revolution: Very fancy slider plug-in. Create amazing sliders with photos and videos and text and animation and pretty much any other thing you could also for. Democracy Poll: Good for creating polls for people to vote on things. Not the most essential thing on the planet, but a fun feature. Envira Gallery: Create gorgeous photo galleries. WP Instagram Widget: Adds your Instagram stream to your sidebar or footer. Contact Form 7: Creates contact forms. Not super exciting. But you need a contact form, and this is pretty much the gold standard. EWWW Image Optimizer: Optimizes your images to make your blog run faster and smoother. Akismet: Anti-spam plug-in. Yay for no more spam. BackWPup: Backs up your blog. Important, for obvious reasons. W3 Total Cache: Makes your blog run faster by doing all sorts of techie things. That's my best explanation. Pretty Links: Organize your affiliate links. SUPER useful if you have a lot of links. Or even if they're not affiliate links, you could just use it for regular links. Google Analytics: Installs the GA code onto your blog so you don't have worry about doing it right. Pinterest Verify: Installs the Pinterest verification code onto your blog. I fight with this thing every time, so this one is useful. Maintenance: Puts up a “coming soon” type page in place of your homepage. Useful if you're launching, or if you just need to take your blog down for maintenance for the day. SumoMe: See above. Share bars and image sharing buttons. Cresta Social Share: Another share bar. Allows for a lot of customization. Social Warfare: Very popular share bar. Lots of customization. Simple Social Icons: Put social icons in your sidebar. King Sumo: King Sumo is the ultimate giveaway plug-in. I warn you, this is probably the most expensive thing on this entire resource list. But, if you want the best of the best viral giveaways, this is where it's at. Aside from the fact that it's easy to use and looks great, the advantage of King Sumo is that it promotes social sharing. It generates a unique link for every subscriber and tells them that for every friend that signs up through their link, they'll get an extra [3, 5, 10, whatever] number of entries. So it encourages people to share your giveaway on Facebook or Twitter or whatever, getting you more entries and more subscribers. It also integrates perfectly with most email providers (including my fav, ConvertKit, so you're covered there). If you entered my Organized Blogger Bundle giveway, that was the work of King Sumo. I also like that it creates an entire page for itself, as opposed to just being embedded on a normal page. ContestFriend: If you want a free alternative to King Sumo, ContestFriend does more or less the same thing. But, it looks a fraction as nice. So, trade offs. Gleam: Gleam is another giveaway platform. This one is not a plug-in, rather you sign up on the website. You can host all kinds of contests and giveaways, including Instagram photo contests. I have not tried doing so yet, but I hear good things. Beaver Builder: Claims to work with any theme. I haven't really tested that theory, but the little that I have played with it, it's very easy to use. Visual Composer: I find VC kind of hard to get the hang out, but some people really like it. Divi (Divi Theme): I've just started experimenting with Divi. So far, so good. I like that you can type right on the page and drag sizes around. I haven't used it a ton yet, though. Cornerstone (X Theme): I used Cornerstone when I was using X Theme, and I really liked it. I found it very easy to use and customize. WP Notification Bar: Probably the best notification bar out there. It can do a huge number of things, including links, buttons, countdowns, social buttons, and more. And it's all customizable with colors and buttons and whatnot. The downside is that there's a yearly fee. But it looks and functions great. Bug-me-bar: Bug-me-bar's main coolness is that it changes colors. I love that it changes colors. The reason I don't use it, is because you can' t put a button or a fill-in field on it, just links. So it's not super functional. But I do love those changing colors. Note: SumoMe and OptinMonster also have this capability (see above in the opt-in section). SumoMe, LeadPages, and OptinMonster all have this capability. See above. Yoast: There are other SEO plug-ins, but I've never really heard anyone recommend them. Yoast is really where it's at. It both works behind the scenes and prompts you to change things in your post to up your SEO. It's easy to use, and I've really never heard a bad thing about it. A must-have. There are any number of places to buy themes, but here are a few of my favorites. Creative Market: Creative Market is kind of like Etsy, but for things like themes and fonts and other electronic things. It's got really, really great stuff from independent people. I've seen tons of great themes on there, and have purchased from them in the past. I love browsing on there and do it all the time (probably too much). Etsy: We all know what Etsy is. But you may not have known that they also have themes. Well, they do. Check it out. Theme Forest: Theme Forest has a huge number of paid themes. A lot of the biggest and most popular themes can be found on Theme Forest, including my current theme, CheerUp (which I love, by the way). Elegant Themes: Elegant Themes has a package deal where you get like 87 themes for one low price. Now, you don't need 87 themes. But the price is low. And you also get all their plug-ins, including Bloom. And most importantly, it includes Divi, which is their big theme. The other themes on there I've never really looked into. But Divi has a big following. I've experimented with it a little bit myself, although haven't actually put it up on a live site yet. But I like it. Bluchic: Feminine themes. I like them a lot. A Prettier Web: More feminine themes. Woo Themes: More popular themes. Beacon: This is what I use to create my lead magnets. It makes it really easy to create, and I like the look a lot. It's not THE most customizable…it only really has a few looks. I don't mind this because I want all mine to look the same to establish my brand. But if you want 100 different looks, this wouldn't be for you. Check out my resource library to see examples of Beacon in action. Apple Pages: Pages can be used for tons of things, but lead magnets are one of them. It's pretty easy to use, and there are tons of customizability options. Google Docs: Not the most extensive tool on the planet, but very easy to use. I use Google Docs for all my Word docs and love it. I don't use it for lead magnets just because it doesn't have that many graphic options, but if you want something simple (and free), you totally could. Photoshop: We all know what Photoshop is. I've never been a Photoshop person (not because it's not awesome, but just because I lack the skills), although I did just sign up for a class, so maybe there will be good things in my future. This is not going to be the easiest option by any menas, but if you know how to use it, you could create amazing lead magnets on here. Canva: Free and easy to use. I do not use Canva for my lead magnets, mostly just because I like Beacon so much. But I use it for pretty much all my social media and blog graphics. Love it. Teachable: Teachable is, as far as I know, the king of online course creation right now. Almost every course that I have taken has been on Teachable and people just swear by it. It's got a great platform, is very easy to use, allows you to have wide leeway with your sales page, and has very competitive rates both for monthly plans and for the cut they take. 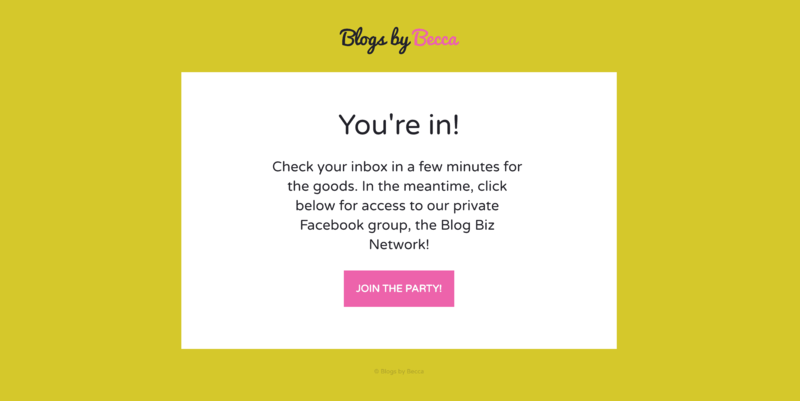 Sign up for their mailing list because they offer a ton of super helpful blog posts and webinars (probably too many, I get a lot of Teachable emails…but they are really helpful!). Thinkific: Thinkific is an alternative to Teachable. Udemy: The big thing with Udemy is that they offer a marketplace (Teachable and Thinkific do not). But, if they help you advertise and that's how your course gets sold, they take a big cut. They also cap the course prices, which Teachable and Thinkific do not. I wouldn't personally create on Udemy, but I guess it's popular for a reason? Making Sense of Affiliate Marketing: This is not an affiliate program. Rather, it's a course on affiliate marketing. And it is awesome. If you are going to get into affiliate marketing, I HIGHLY recommend this course. The teacher, Michelle, makes over $50,000/month with affiliate marketing. So, she knows what's up. It's extremely useful, and totally changed the way I do things. Share a Sale: Affiliate network with lots of companies. Commission Junction: Same as above. Click Bank: Same as above. Amazon Associates: Easily convert anything on Amazon to an affiliate product. Super easy to use and not a lot of hoops to jump through. Note many individual companies just have their own, so always Google it too. And there are lots of other big programs. These are the few that I've used. Canva: I use Canva for almost all of my blog and social media graphics. It's SO easy to use (and believe me, when I say that, you know it's true…I lack all design skills). And it's free. Cannot say enough good things about Canva. Extra points because it automatically sets the sizes for Instagram posts, Pinterest graphics, etc. Stencil: Similar to Canva. I find Canva a little easier to use. Snappa: Similar to Canva, again. I've just started using Snappa, but so far I like it. Magic Mockups: Creates mockups of pretty much whatever. So put your blog on that iMac screen and be one of those cool people. Photoshop: You know what Photoshop is. Google Hangouts/YouTube Live: I only list this one because (a) it's free, (b) it's (relatively) easy to use, (c) it embeds in Leadpages, and (d) it's the only one I actually use. I definitely do not pay for my webinars. Highly recommend checking out Google Hangouts/YouTube Live (it used to be Google Hangouts and now I think they call it YouTube Live? But it still says Google Hangsouts in some places. Either way, same thing). Pixabay: Huge variety. I use this one a lot. Death to the Stock Photo: Has some interesting stuff. Split Shire: Same as above. Stock Snap: Same as above. Kaboom Pics: Same as above. Pic Jumbo: Same as above. Bloguettes: I love Bloguettes. They're feminine photos, mostly, but more unique than what you're probably thinking of. I use them a lot on this site. Shutterstock: Huge. They have everything. Adobe stock photos: Same as Shutterstock, pretty much. Haute Chocolate: Girly, feminine photos. Love them. WHEW. Did you make it through all that?! If you did, you are a rockstar. And you are definitely ready to rock your blog out. Good luck, and let me know how it goes! !